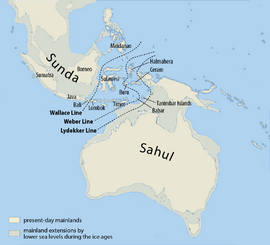 The continent of Sahul before the rising ocean sundered Australia and New Guinea after the last ice age. The gardens of the New Guinea Highlands are ancient, intensive permacultures, adapted to high population densities, very high rainfalls (as high as 10,000 mm/yr (400 in/yr)), earthquakes, hilly land, and occasional frost. Complex mulches, crop rotations and tillages are used in rotation on terraces with complex irrigation systems. There is evidence that New Guinea gardeners invented crop rotation well before western Europeans. A unique feature of New Guinea permaculture is the silviculture of Casuarina oligodon, a tall, sturdy native ironwood tree, suited to use for timber and fuel, with root nodules that fix nitrogen. Pollen studies show that it was adopted during an ancient period of extreme deforestation. The western part of the island was in contact with kingdoms in other parts of modern-day Indonesia. The Negarakertagama mentioned the region of Wanin in eastern Nusantara as part of Majapahit's tributary. This has been identified with the Onin Peninsula, part of the Bomberai Peninsula near the city of Fakfak. The sultans of Tidore, in Maluku Islands, claimed sovereignty over various coastal parts of the island. 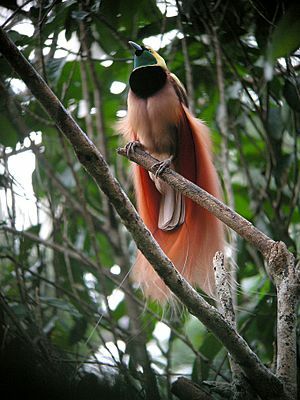 During Tidore's rule, the main exports of the island during this period were resins, spices, slaves and the highly priced feathers of the bird-of-paradise. Sultan Nuku, one of the most famous Tidore sultans who rebelled against Dutch colonization, called himself "Sultan of Tidore and Papua", during his revolt in 1780s. He commanded loyalty from both Moluccan and Papuan chiefs, especially those of Raja Ampat Islands. Following Tidore's defeat, much of the territory it claimed in western part of New Guinea came under Dutch rule as part of Dutch East Indies. The first European contact with New Guinea was by Portuguese and Spanish sailors in the 16th century. 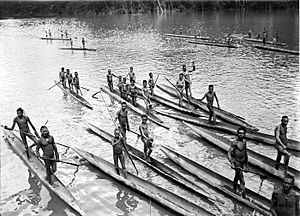 In 1526–27, the Portuguese explorer Jorge de Meneses saw the western tip of New Guinea and named it ilhas dos Papuas. In 1528, the Spanish navigator Álvaro de Saavedra also recorded its sighting when trying to return from Tidore to New Spain. In 1545, the Spaniard Íñigo Ortíz de Retes sailed along the north coast of New Guinea as far as the Mamberamo River, near which he landed on 20 June, naming the island 'Nueva Guinea'. The first map showing the whole island (as an island) was published in 1600 and shows it as 'Nova Guinea'. In 1606, Luís Vaz de Torres explored the southern coast of New Guinea from Milne Bay to the Gulf of Papua including Orangerie Bay, which he named Bahía de San Lorenzo. His expedition also discovered Basilaki Island naming it Tierra de San Buenaventura, which he claimed for Spain in July 1606. On 18 October, his expedition reached the western part of the island in present-day Indonesia, and also claimed the territory for the King of Spain. 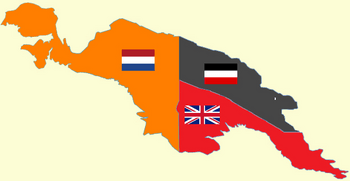 Netherlands New Guinea and the Australian territories were invaded in 1942 by the Japanese. The Australian territories were put under military administration and were known simply as New Guinea. The highlands, northern and eastern parts of the island became key battlefields in the South West Pacific Theatre of World War II. 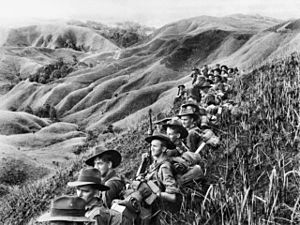 Papuans often gave vital assistance to the Allies, fighting alongside Australian troops, and carrying equipment and injured men across New Guinea. Approximately 216,000 Japanese, Australian and U.S. soldiers, sailors and airmen died during the New Guinea Campaign. During the 1950s, the Dutch government began to prepare Netherlands New Guinea for full independence and allowed elections in 1959; the elected New Guinea Council took office on 5 April 1961. The Council decided on the name of West Papua for the territory, along with an emblem, flag, and anthem to complement those of the Netherlands. On 1 October 1962, the Dutch handed over the territory to the United Nations Temporary Executive Authority, until 1 May 1963, when Indonesia took control. The territory was renamed West Irian and then Irian Jaya. In 1969, Indonesia, under the 1962 New York Agreement, organised a referendum named the Act of Free Choice, in which hand picked Papuan tribal elders reached a consensus to continue the union with Indonesia. 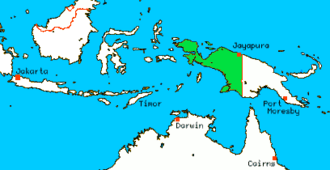 In 2000, Irian Jaya was formally renamed "The Province of Papua" and a Law on Special Autonomy was passed in 2001. 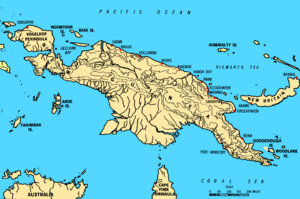 The current population of the island of New Guinea is about eleven million. Many believe human habitation on the island dates to as early as 50,000 BC, and first settlement possibly dating back to 60,000 years ago has been proposed. The island is presently populated by almost a thousand different tribal groups and a near-equivalent number of separate languages, which makes New Guinea the most linguistically diverse area in the world. Ethnologue's 14th edition lists 826 languages of Papua New Guinea and 257 languages of Irian Jaya, total 1073 languages, with 12 languages overlapping. 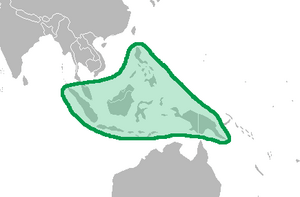 They fall into one of two groups, the Papuan languages and the Austronesian languages. 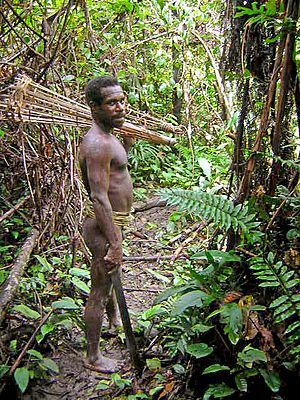 Current evidence indicates that the Papuans (who constitute the majority of the island's peoples) are descended from the earliest human inhabitants of New Guinea. 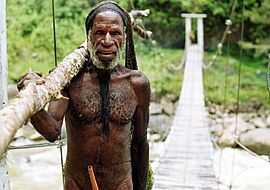 These original inhabitants first arrived in New Guinea at a time (either side of the Last Glacial Maximum, approx 21,000 years ago) when the island was connected to the Australian continent via a land bridge, forming the landmass known as Sahul. These peoples had made the (shortened) sea-crossing from the islands of Wallacea and Sundaland (the present Malay Archipelago) by at least 40,000 years ago, subsequent to the dispersal of peoples from Africa (circa) 50,000 – 70,000 years ago. The ancestral Austronesian peoples are believed to have arrived considerably later, approximately 3,500 years ago, as part of a gradual seafaring migration from Southeast Asia, possibly originating in Taiwan. 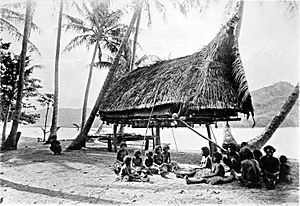 Austronesian-speaking peoples colonized many of the offshore islands to the north and east of New Guinea, such as New Ireland and New Britain, with settlements also on the coastal fringes of the main island in places. 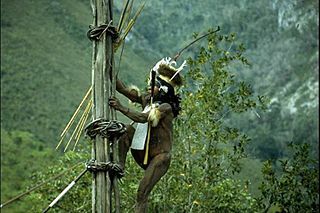 Human habitation of New Guinea over tens of thousands of years has led to a great deal of diversity, which was further increased by the later arrival of the Austronesians and the more recent history of European and Asian settlement through events like transmigration. About half of the 2.4 million inhabitants of Indonesian Papua are Javanese migrants. With some 786,000 km2 of tropical land—less than one-half of one percent (0.5%) of the Earth's surface—New Guinea has an immense biodiversity, containing between 5 and 10 percent of the total species on the planet. This percentage is about the same amount as that found in the United States or Australia. A high percentage of New Guinea's species are endemic, and thousands are still unknown to science: probably well over 200,000 species of insect, between 11,000 and 20,000 plant species, and over 650 resident bird species. Most of these species are shared, at least in their origin, with the continent of Australia, which was until fairly recent geological times part of the same landmass (see Australia-New Guinea for an overview). The island is so large that it is considered 'nearly a continent' in terms of its biological distinctiveness. Biogeographically, New Guinea is part of Australasia rather than the Indomalayan realm, although New Guinea's flora has many more affinities with Asia than its fauna, which is overwhelmingly Australian. Botanically, New Guinea is considered part of Malesia, a floristic region that extends from the Malay Peninsula across Indonesia to New Guinea and the East Melanesian Islands. The flora of New Guinea is a mixture of many tropical rainforest species with origins in Asia, together with typically Australasian flora. Typical Southern Hemisphere flora include the conifers Podocarpus and the rainforest emergents Araucaria and Agathis, as well as tree ferns and several species of Eucalyptus. The black-bellied fruit bat is native to the Bismarck Archipelago of Papua New Guinea. 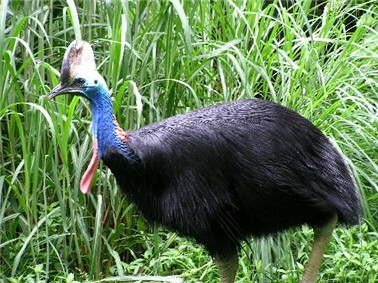 The southern cassowary (Casuarius casuarius). A Papuan hornbill (Rhyticeros plicatus), the only species of hornbill native to New Guinea. 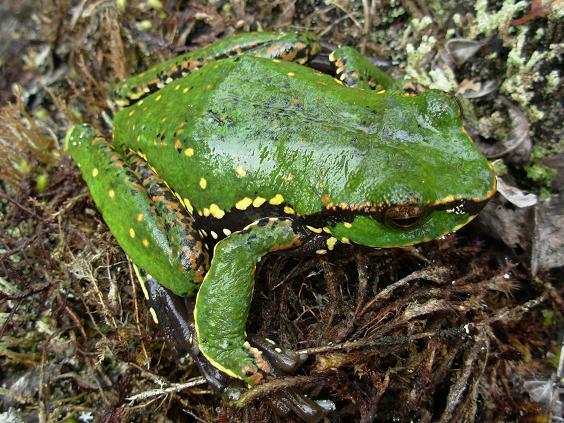 The angiana tree frog (Litoria angiana), common to the highlands of New Guinea. 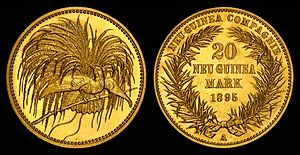 New Guinea Facts for Kids. Kiddle Encyclopedia.